This study aims to identify an effective carbon source which enhances not only the microbial load but also the shrimps growth. The carbon source cane sugar, molasses and jaggery were tested in 100 L culture tanks with stocking density of 30 m‾2 Peneus monodon seeds for a culture period of 40 days. Jaggery biofloc tank shows highest floc formation (22 mL), highest survival (86%) and highest ABW (6 g), proximate composition of jagerry biofloc had higher protein level (35%) followed by mollases and sugar culture tanks. It confirms jaggery is a new efficient carbon source for shrimp culture system. K. Sakkaravarthi and G. Sankar, 2015. Identification of Effective Organic Carbon for Biofloc Shrimp Culture System. Journal of Biological Sciences, 15: 144-149. The Biofloc Technology (BFT) promotes suspended growth in ponds, consisting of phytoplankton, bacteria, aggregates of dead particulate organic matter and grazers of the bacteria (Hargreaves, 2006). The addition of fertilizers or carbon sources directly to the pond water is a way to augment the natural production of these food organisms (Crab et al., 2007; Uddin et al., 2007). If carbon and nitrogen are well balanced in the culture solution, the nitrogenous waste generated by the cultivated organisms, especially ammonium will be converted into bacterial biomass (Schneider et al., 2005). By adding carbohydrates to the pond, bacterial growth is stimulated and nitrogen uptake through the production of microbial proteins takes place (Avnimelech, 1999). This promoted nitrogen uptake by bacterial growth can decrease the putatively toxic ammonium within a few hours while nitrification in conventionally used biofilters is slower (Hargreaves, 2006). Nitrogenous by-products can be easily taken up by micro biota and they serve as a substrate for operating biofloc systems and production of microbial protein cells (Mishra et al., 2008). This approach is successfully performed by control of carbon and nitrogen (C:N) ratio to promote ammonia for heterotrophic microorganisms as a major pathway of ammonia control. Effective use of microbial biomass has collateral benefits for species that have a filtering apparatus and digestive system that better assimilate biofloc (Burford et al., 2003; Hari et al., 2004; Hargreaves, 2006). High C:N ratio will help convert ammonium and organic nitrogenous waste into bacterial protein biomass (Avnimelech et al., 1994; Avnimelech, 1999; Schneider et al., 2005). Regarding feeding, this technique can operate at a no cost, because it upgrades carbohydrate to protein. Moreover, one does not need to invest in an external water treatment system (Crab et al., 2007). The BFT is achievable using different types of organic carbon. The road to go for the BFT is to use carbohydrates. There are many considerations for carbon source selection like local availability, cost, biodegradability and efficient bacterial assimilation. According to Kuhn et al. (2009) improvement of floc nutritional value using different carbon sources needs further investigations. So, the goal of the present study was to assess the nutritional value of bioflocs developed by different carbon sources and their ability to serve as a feed for Peneus monodon post larvae. Bioflocs were grown on different carbon substrates such as sugar (sucrose), molasses and jaggery. The volume of floc formation and the general nutritional composition of the bioflocs were investigated and also the growth and survival rate of Peneus monodon post larvae fed with bioflocs were estimated. Carbon source: Sugar (sucrose-cane sugar) and jaggery were collected from a commercial seller. Molasses were collected from an aqua farm at Marakkanam (Fig. 1a-d). Seed collection: Healthy P. monodon seeds were collected from a commercial hatchery at Marakkanam, Tamil Nadu. Experimental design: The experiment was carried out for 40 days in the month of June-July, year 2012 at Vataram shrimp farm at Marakkanam. Peneus monodon seeds were stocked at 30 m2 in 100 L rectangular tank. For all the experiments triplicates were maintained. The tanks were equipped with a circular hose with four porous stones set at the bottom to keep intense aeration. Forty percent protein feed (Grobest) was given at four times (6.00 am, 12.00 noon, 6.00 pm, 11.00 pm). Each tank had received one liter healthy pond water as microbial inoculum. Addition of carbon: Carbon source was added at a rate of 50% of feed applied to each biofloc treatment to maintain an optimum C:N ratio for bacteria (Goldman et al., 1987; Avnimelech, 1999; Hargreaves, 2006). Shrimp performance: Survival rate (%), Food Conversion Ratio (FCR), Average final Body Weight (ABW), were estimate to assess dietary effects on shrimp performance. 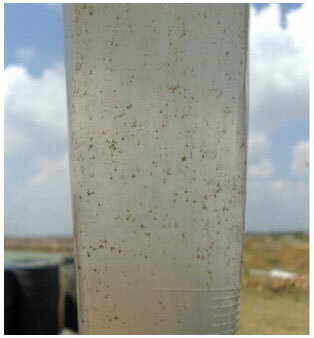 Volume of biofloc: Biofloc formation was measured by the floc settlement in imhoff cone by pouring 1 L of cultured tank water (Avnimelech, 2009) (Fig. 2-4). Proximate composition of biofloc: The biofloc was collected from each treatment using imhoff cone by filtering through a 100 μ mesh, the content was dried in an oven at 70°C to constant weight. The samples were analyzed for the protein, carbohydrate and lipid by adopting standard method of Lowry et al. (1951), DuBois et al. (1956) and Folch et al. (1957), respectively. One gram of powdered biofloc sample was taken in a muffle furnace at 60°C for 4 h. The residue or ash content was weighed and the percentage was calculated. Fiber content was measured by Association of Analytical Chemist Methods (AOAC., 2000). Statistical analysis: Two-way analysis of variance (ANOVA, a = 0.05) was used to detect differences between treatments by using SPSS Package. Throughout the experiment except in control tank A, culture water was not exchanged in other tanks. To compensate the water evaporation, addition of water only carried out. Tank A received adequate water exchange. Shrimp performance: The control tank A showed lowest survival (65%) and lowest ABW (2.2 g). Among carbon sources, jaggery showed highest survival (86%) and highest ABW (6 g), while molasses and sugar showed 74 and 78% survival and 3.2 and 4.5 g ABW, respectively. The values were highly significant between carbon sources and days of culture (Fig. 5 and 6). 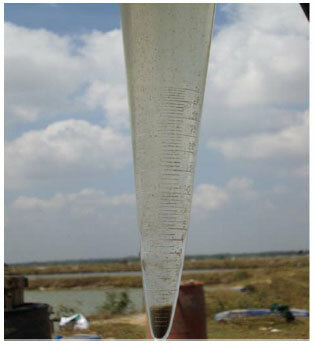 Volume of biofloc: The control Tank A, showed lowest floc formation of 2 mL at 40th day. Molasses and sugar showed floc volume of 12 and 15 mL, respectively. Jaggery showed highest floc formation (22 mL) (Fig. 7). The values are highly significant. Proximate composition of biofloc: Among the carbon added tanks jaggery showed highest protein of 35.5% and carbohydrate of 28.8%. Molasses showed lowest protein (25.6%) and carbohydrate (20.2%) (Fig. 8). The values are highly significant between carbon sources. Lipid level shows no significant differences Molasses 0.4%, sugar and jaggery both showed 0.5%. Jaggery showed 1.0% fibre, sugar showed low 0.5% fibre. Heterotrophic bacteria have the ability to synthesize protein from organic carbon and inorganic nitrogen (Avnimelech, 1999; Chamberlain et al., 2001). However, high protein diets usually employed in intensive aquaculture systems have C:N ratios of less than 10:1. Such proportions may slow down the rate of bacterial waste decomposition, resulting in the accumulation of inorganic nitrogen (ammonia, nitrite and nitrate) in the culture system (McIntosh, 2000). Chamberlain et al. (2001) recommended the use of balanced mixtures of carbonaceous and nitrogenous materials with a C:N ratio of approximately 20:1 to stimulate bacterial decomposition of organic wastes. In this study C:N ratio approximately maintained as 20:1. Inoculation using water and sediment from older or BFT ponds can accelerate the biofloc development process (Correia et al., 2002). This is a biological jump-start that is commonly used in certain bioreactors, such as in wastewater treatment systems (Correia et al., 2002). In this study also the inoculum was taken from the older healthy pond. The common sources of microbial energy in the BFT are flour, molasses and starch (Avnimelech, 1999; Burford et al., 2004; Hari et al., 2004). The impact of various carbon sources on the outgrowth of bioflocs in activated sludge systems has been documented (Bodik et al., 2009). But in aquaculture system it is very much limited. In this study commonly used substrates like molasses, sugar (sucrose) and a new source "Jaggery" were used as carbon source. Jaggery is made from sugarcane juice by directly solidifying with heat. It is considered as a food material, as it contains large quantity of minerals in addition to energy and it is consumed directly as sweetener and also it is used in different preparations including animal feed mixtures (Singh, 2001). It is easily available and cheaper than raw sugar but higher in nutritive value. The BFT may provide a sustainable method to maintain water quality within an acceptable range for prawn or shrimp species (Boyd and Zimmerman, 2000). Low survival rates or decreased growth due to toxic ammonia and nitrite can be prevented and therefore, BFT may make it possible to increase growth yields and survival levels at low water replacement rates, while a potential additional natural food resource is provided, more specifically in the form of bioflocs (Mallasen and Valenti, 2006; Naqvi et al., 2007; Asaduzzaman et al., 2008). Present study confirmed these statements with the lower survival rate (65%) in control tank-A, because, it did not receive any carbon and hence, biofloc formation was limited. Increased survival rate in all other biofloc tanks were observed. Among biofloc tanks, jaggery added tank D showed 86% survival which was highest among all tanks. The nutritional composition of the bioflocs was significantly influenced by the carbon source, the same could be observed when looking at survival. The nutritional value of the bioflocs is also dependent on the ability to both ingest and digest the bioflocs. Survival is measured in the post larval stage, where feed digestibility is generally less in the larval stages (Das et al., 2007). The present study confirmed all the carbon sources which were used had higher survival than control and the growth rate was higher in jaggery tank (86%), so, the digestibility of the jaggery tank biofloc was higher than other carbon sources bioflocs. The molasses and sugar bioflocs showed lesser digestibility. So, these biofloc fed animals showed a low survival. By using molasses as carbon source, relatively high protein levels have been recorded: 30.4 (Emerenciano et al., 2012), 31.2 (Tacon et al., 2002) and 31.1% (Wasielesky et al., 2006). In present study, the protein value of molasses Tank B was 29.4%, relatively close to the above results. Crude lipid contents in the present study averaged to 0.5%, which is also closer to the values of 0.47% as reported by Wasielesky et al. (2006). Proximate composition of jagerry biofloc had higher protein level (35%) and equal lipid level (0.5%) as compared with molasses and sugar. It is in support of Vijayendra et al. (2001) who have reported that jaggery is a promising carbon source for the economical production of pullulan, which is produced by microorganism fungi. Anupama et al. (2010) has used jaggery as carbon source for yeast Saccharomyces cerevisiae. The sugars essentially provide the energy, necessary for cell growth (Degeest and De Vuyst, 2000). Singh et al. (2009) have reported that jaggery supports the heterotrophic bacteria growth. They found that stored jaggery shows high 13×106 heterotrophic bacterial count. These are all the clear indication that jaggery supports fungi, yeast and bacteria growth. This study also confirmed that jaggery increased microbial growth. It was also confirmed by volume of biofloc formation, a clear evidence for higher microbial growth. Jaggery showed 12 mL biofloc formation in 15th day, which was the maximum floc formation in molasses at 30th day, whereas, sugar showed it on 25th day. It was also evident by high protein level in jaggery tank, because bacteria are the single cell protein which developed well when jaggery was used as carbon source. Jaggery is considered as a food material, as it contains a large quantity of minerals in addition to energy and is consumed directly as sweetener and also in different preparations including animal feed mixtures (Singh, 2001). Venkataramanan et al. (2010) have used jaggery as carbon source for lactic acid bacteria in silage production, which increases the nutritive value. Silage is used as nutritive animal feed. The present study supported the statements by showing higher growth in terms of ABW. The jaggery tank showed highest (6 g) ABW as compared with control and other carbon source tanks and jaggery biofloc had comparatively more nutritive value than other carbon sources. Molasses is the commonly used carbon source but its usage legally restricted because it is a major source for illegal arrack fermentation in country like India. Sugar has high economic importance for any country so it should not be largely exploited. But jaggery satisfies considerations as new carbon source by having characters like local availability, low cost, efficient biodegradability bacterial assimilation and nutritive biofloc formation. So, the present study confirmed that jaggery could be used as organic carbon substrates in biofloc culture systems of the shrimp Penaeus monodon and concluded that jaggery is a novel substrate for shrimp biofloc culture system. AOAC., 2000. Official Methods of Analysis. 16th Edn., Association of Official Analytical Chemists, Washington, DC., USA. Anupama, P.M., D.G. Mahesh and C. Ayyanna, 2010. Optimization of fermentation medium for the production of ethanol from jaggery using box-behnken design. Int. J. Applied Biol. Pharma. Technol., 1: 34-45. Asaduzzaman, M., M.A. Wahab, M.C.J. Verdegem, S. Huque, M.A. Salam and M.E. Azim, 2008. C/N ratio control and substrate addition for periphyton development jointly enhance freshwater prawn Macrobrachium rosenbergii production in ponds. Aquaculture, 280: 117-123. Avnimelech, Y., 1999. Carbon/nitrogen ratio as a control element in aquaculture systems. Aquaculture, 176: 227-235. Avnimelech, Y., 2009. Biofloc Technology: A Practical Guide Book. World Aquaculture Society, Baton Rouge, Louisiana, ISBN: 9781888807165, Pages: 182. Avnimelech, Y., M. Kochva and S. Diab, 1994. Development of controlled intensive aquaculture systems with a limited water exchange and adjusted carbon to nitrogen ratio. Israeli J. Aquaculture-Bamidgeh, 46: 119-131. Bodik, I., A. Blstakova, S. Sedlacek and M. Hutnan, 2009. Biodiesel waste as source of organic carbon for municipal WWTP denitrification. Bioresour. 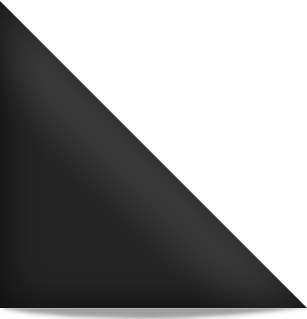 Technol., 100: 2452-2456. Boyd, C. and S. Zimmerman, 2000. Grow-Out Systems-Water Quality and Soil Management. In: Freshwater Prawn Culture-The Farming of Macrobrachium rosenbergii, New, M.B. and W.C. Valenti (Ed.). Blackwell Science, Oxford, UK., pp: 221-238. Burford, M.A., M.J. Sellars, S.J. Arnold, S.J. Keys, P.J. Crocos and N.P. Preston, 2004. Contribution of the natural biota associated with substrates to the nutritional requirements of the post-larval shrimp, Penaeus esculentus (Haswell), in high-density rearing systems. Aquac. Res., 35: 508-515. Burford, M.A., P.J. Thompson, R.P. McIntosh, R.H. Bauman and D.C. Pearson, 2003. Nutrient and microbial dynamics in high-intensity, zero-exchange shrimp ponds in Belize. Aquaculture, 219: 393-411. Chamberlain, G., Y. Avnimelech, R.P. McIntosh and M. Velasco, 2001. Advantages of aerated microbial reuse systems with balanced C/N. Nutrient transformation and water quality benefits. Global Aquac. Alliance Advocate, 4: 53-56. Correia, E.S., J.A. Pereira, M.O. Apolinario, A. Horowitz and S. Horowitz, 2002. Effect of pond aging on natural food availability and growth of the freshwater prawn Macrobrachium rosenbergii. Aquacult. Eng., 26: 61-69. Crab, R., Y. Avnimelech, T. Defoirdt, P. Bossier and W. Verstraete, 2007. Nitrogen removal techniques in aquaculture for a sustainable production. Aquaculture, 270: 1-14. Das, S.K., V.K. Tiwari, G. Venkateshwarlu, A.K. Reddy, J. Parhi, P. Sharma and J.K. Chettri, 2007. Growth, survival and fatty acid composition of Macrobrachium rosenbergii (de Man, 1879) post larvae fed HUFA-enriched Moina micrura. Aquaculture, 269: 464-475. Degeest, B. and L. De Vuyst, 2000. Correlation of activities of the enzymes α-phosphoglucomutase, UDP-galactose 4-epimerase and UDP-Glucose Pyrophosphorylase with exopolysaccharide biosynthesis by Streptococcus thermophilus LY03. Applied Environ. Microbiol., 66: 3519-3527. Emerenciano, M., E.L.C. Ballester, R.O. Cavalli and W. Wasielesky, 2012. Biofloc technology application as a food source in a limited water exchange nursery system for pink shrimp Farfantepenaeus brasiliensis (Latreille, 1817). Aquacult. Res., 43: 447-457. Goldman, J.C., D.A. Caron and M.R. Dennett, 1987. Regulation of gross growth efficiency and ammonium regeneration in bacteria by substrate C: N ratio1. Limnol. Oceanogr., 32: 1239-1252. Hargreaves, J.A., 2006. Photosynthetic suspended-growth systems in aquaculture. Aquacult. Eng., 34: 344-363. Hari, B., B.M. Kurup, J.T. Varghese, J.W. Schrama and M.C.J. Verdegem, 2004. Effects of carbohydrate addition on production in extensive shrimp culture systems. Aquaculture, 241: 179-194. Kuhn, D.D., G.D. Boardman, A.L. Lawrence, L. Marsh and G.J. Flick Jr., 2009. 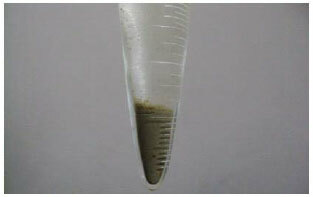 Microbial floc meal as a replacement ingredient for fish meal and soybean protein in shrimp feed. Aquaculture, 296: 51-57. Mallasen, M. and W.C. Valenti, 2006. Effect of nitrite on larval development of giant river prawn Macrobrachium rosenbergii. Aquaculture, 261: 1292-1298. McIntosh, R.P., 2000. Changing paradigms in shrimp farming: IV. Low protein feeds and feeding strategies. Glob. Aquac. Advocate, 3: 44-50. Mishra, J.K., T.M. Samocha, S. Patnaik, M. Speed, R.L. Gandy and A.M. Ali, 2008. Performance of an intensive nursery system for the Pacific white shrimp, Litopenaeus vannamei, under limited discharge condition. Aquacultural Eng., 38: 2-15. Naqvi, A.A., S. Adhikari, B.R. Pillai and N. Sarangi, 2007. Effect of ammonia‐N on growth and feeding of juvenile Macrobrachium rosenbergii (De‐Man). Aquacult. Res., 38: 847-851. Schneider, O., V. Sereti, E.H. Eding and J.A.J. Verreth, 2005. Analysis of nutrient flows in integrated intensive aquaculture systems. Aquacult. Eng., 32: 379-401. Singh, J., 2001. Nutritive and eco-friendly jiggery-A sweetener of new millennium. Proceedings of the 88th Indian Science Congress, January, 3-7, 2001, IARI, New Delhi, India -. Singh, S., A. Dubey, L. Tiwari and A.K. Verma, 2009. 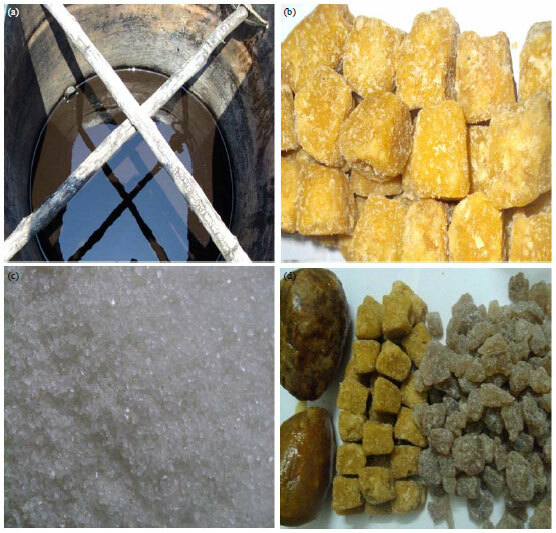 Microbial profile of stored jaggery: A traditional Indian sweetener. Sugar Tech., 11: 213-216. Tacon, A.G.J., J.J. Cody, L.D. Conquest, S. Divakaran, I.P. Forster and O.E. Decamp, 2002. Effect of culture system on the nutrition and growth performance of Pacific white shrimp Litopenaeus vannamei (Boone) fed different diets. Aquacult. Nutr., 8: 121-137. Uddin, M.S., A. Farzana, M.K. Fatema, M.E. Azim, M.A. Wahab and M.C.J. Verdegem, 2007. Technical evaluation of tilapia (Oreochromis niloticus) monoculture and tilapia-prawn (Macrobrachium rosenbergii) polyculture in earthen ponds with or without substrates for periphyton development. Aquaculture, 269: 232-240. Venkataramanan, R., C. Sreekumar, R. Anilkumar, P. Selvaraj, N.M. Vidhya and I. Mathagowder, 2010. Effect of jaggery on the quality and intake levels of maize silage. Trop. Anim. Health Prod., 42: 1027-1029. Vijayendra, S.V.N., D. Bansal, M.S. Prasad and K. Nand, 2001. Jaggery: A Novel substrate for pullulan production by Aureobasidium pullulans CFR-77. Process Biochem., 37: 359-364. Wasielesky, Jr. W., H. Atwood, A. Stokes and C.L. Browdy, 2006. Effect of natural production in a zero exchange suspended microbial floc based super-intensive culture system for white shrimp Litopenaeus vannamei. Aquaculture, 258: 396-403.